In April we had an interesting talk by Dr Paul Hindle on Maps and Turnpikes which covered the beginnings of the Turnpike Trusts, building of the new turnpike roads and improvement of existing roads. The first Act establishing a turnpike road was in 1663 while the second one did not happen until the 1690s. During the 18th century thousands of Acts of Parliament established trusts which were given the right to collect a toll in exchange for providing and maintaining a road. A General Turnpike Act was passed in 1773 to speed up the Parliamentary process. The two turnpikes in our area are the Bolton to Blackburn (Blackburn Road) and the Little Bolton to Edenfield (Bradshaw Road), both authorised in 1797. In May our first outing this year was to the Northern Mill Engine Museum which is housed in a warehouse of the old Atlas Mills. This was a very interesting and informative evening. 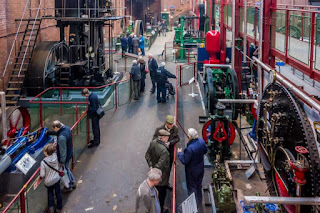 One of the members of the NME Society showed us round the museum, operating the engines and explaining their workings plus a brief history of the mills they were rescued from. The Museum houses one of the largest collections of working textile mill steam engines in the country, and is run entirely by enthusiastic volunteers. They make no charge for admission and rely on subscriptions from Society members and donations from visitors. Regular steam-up days are held throughout the year. In June along with several members of the Wildlife Trust and Friends of Seven Acres we enjoyed our walk on the Kingfisher Trail. One of the Friends talked about the past industry of the area as we walked along. We walked about two miles and refreshments were kindly provided on our arrival at the Wildlife Centre on Bury Road. The Centre has a mini-bus which ferried people back to Longsight Park or to wherever they had parked their cars. The Kingfisher Trail is a 13 mile route along the Croal-Irwell valley running through some of Bolton, Bury and Salford's best green spaces, including Moses Gate Country Park, Clifton Country Park, and Philips Park. July's visit was to Cornerstone Baptist Church where the Pastor, Lee Banfield, welcomed us, showed us round the building and told us about its growth from its foundation in 1977 by Pastor Ron Stidham who was part of a church planting team from the USA. The congregation originally met in Walsh's Institute, Harwood, but as numbers grew a new building became necessary and the present building in Bromley Cross was opened in 1984. It has excellent facilities, kitchen, crèche etc. 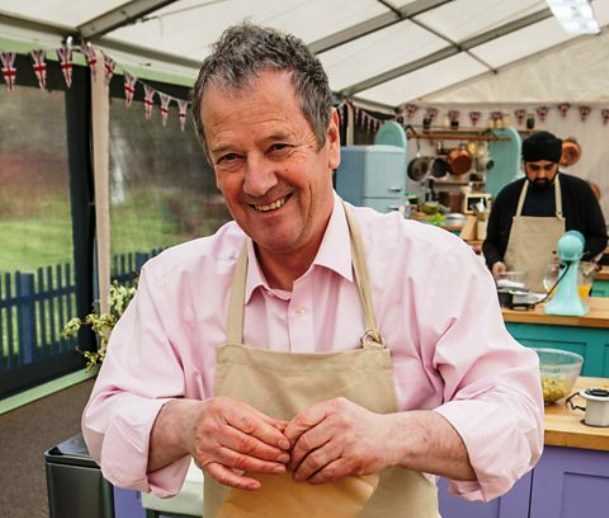 We sat around in very comfortable armchairs and sofas and chatted over tea and biscuits and cakes baked by Lee. 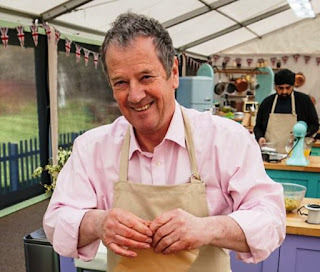 We didn't know it at the time but Lee, a former builder, was a contestant on the Great British Bake-off. Unfortunately he was the first to be voted off! Back in the Community Hall in August for a talk on The Artifacts of Folk Magic by Peter Watson. Peter is an excellent speaker and gave a very entertaining talk. He had no slides or notes and just used various artifacts - such as amulets, items representing the magic number three and the magic colour red - all aimed at offering protection against harm. People in the 17th and 18th centuries were very superstitious and the 'cunning men' - today's con men - played on their fears and the gullible people believed the charms would work. Lucky charms were hung in doorways, windows, chimneys etc to keep out the evil spirits. Dolls to stick pins in to make people fall ill have been found when old houses are being renovated. Peter reckoned that hairs from his cat's tail could cure warts; but as warts have a tendency to disappear as quickly as they appear - who knows? The 10th and 11th of September was National Heritage Weekend and many churches, museums, societies and other organisations held events to celebrate their history, architecture and culture. TLHS was asked by St Anne's Church to participate in their heritage weekend. The church had the chained books given by Humphrey Chetham on display, and the church registers were available for people to look up their ancestors' weddings, baptisms and burials. There was also a display relating to Turton Football Club, one of the oldest football clubs in the country. The event was very well attended on both days, with a lot of interest in our photographic display, and 61 of our publications were sold, which made it a very worthwhile event for the committee members who manned the stall. On September 24th Longsight Methodist Church held a Harwood's Got Talent day to raise funds for the Community Project to build a new multi-purpose building on the site of the present Community Hall and Manse. All the groups who use the hall were invited to participate to show what groups and activities are on offer. Both buildings were in use by numerous groups including St Catherine's Choir, children's' groups, the WI, refreshments etc who were in the Hall; while Harwood Art Group, our photographic display and bookstall, and the architects of the proposed new building were in the converted church building. The architects had their plans and drawings on display which were of particular interest to Fred Horridge, having been a structural engineer during his working life. The speaker for our September meeting Jonathan Ali who had been due to speak about Hawkshaw unfortunately had to cancel due to illness, so once again Fred Horridge stepped into the breach and gave us a very good presentation on Harwood and Bradshaw from early feudal times, through the enclosures and more modern development. There was a very good turnout which included 18 visitors, whether due to having seen the talk advertised in the Bolton News, or after visiting our stall the previous Saturday is not known, but they were very welcome and hopefully will come again. Once again we were invited to the Local History Fair at St Luke's Hall, Chorley Old Rd on October 15th, organised by Halliwell LHS. 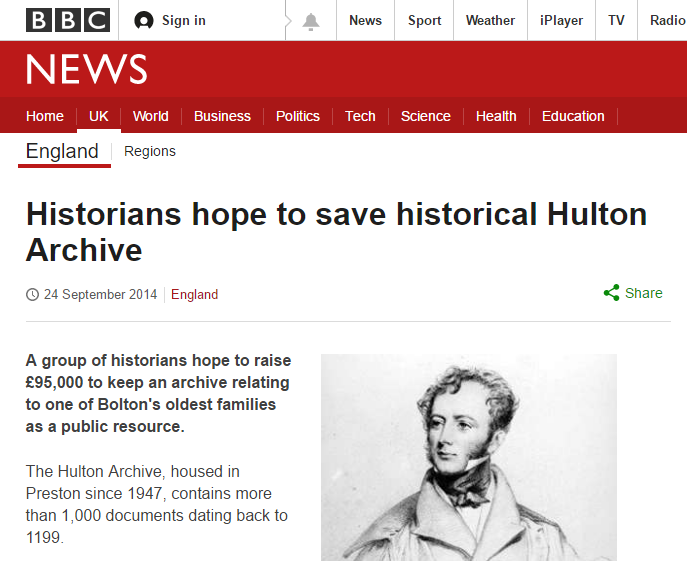 Other societies involved were Bolton Family History Society, Bolton Tram & Bus Society, Horwich Heritage, All Souls Community Centre, and War Memorials Research by Bolton Archives. Hundreds of people must have visited during the course of the day and great interest was shown in all the displays; a favourite was the books of newspaper cuttings for people to browse through. We managed to sell some of our books and it was interesting to chat to other Societies' members. We also enjoyed our pasty and peas lunch! Our October speaker was David Lloyd who took us on a photographic journey round Harwood, Bradshaw and The Oaks area. Many of his excellent photos had been acquired from professional photographers and not previously seen at our meetings. David being a member of Bolton Tram & Bus Society many of his photos were transport related. 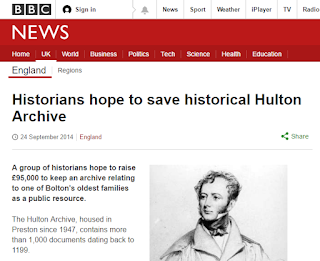 Being donators to a fund to purchase the Hulton Archive (which we will be hearing all about at our November meeting) a couple of representatives of TLHS were invited to attend a Hulton Celebration at the Lancashire Archives, Preston, on October 17th. As the two officers dealing with the donation, Peter Harris and Fred Horridge duly attended and listened to a programme of short talks and speeches followed by a buffet lunch and an opportunity to look at some of the archives, costumes and family portraits. A historical point of interest to TLHS regarding the Hulton Family, is their instigation of the railway from Bolton to Chequerbent, to transport coal from their collieries at Over Hulton. George Stephenson was appointed engineer for this project which was opened by Lady Hulton in 1828, and commenced passenger services in 1831 after completion of the Manchester/Liverpool railway. The centenary of the First World War and the nationwide events to commemorate it has led to local events taking place to ensure the ultimate sacrifice made by so many is never forgotten. The Bolton War Memorials Project is part of a national effort to conserve and protect the nation's war memorials, many of which have fallen into disrepair or been lost. It also aims to ensure that there are skilled volunteers available to assess their condition and take steps to preserve them in the correct way. Workshops have been held at Bolton Central Library to train volunteers in this work. The details of the civic, religious, public, private and commercial war memorials in Bolton are being recorded, photographed and entered on a database, each with its own Imperial War Museum number, by a small team of dedicated volunteers. This research has so far taken three years, and 450 memorials discovered, through hours of detective work on old church magazines, church histories, school log books and records of local companies.They vary from an inscription on a hymn board, to memorial trophies and inscribed goblets at sports clubs. Frequently people had not realised that these items were war memorials. The one date that everyone knows is 1066 - The Battle of Hastings - when Harold Godwinson, the last Anglo-Saxon king of England was defeated by William, Duke of Normandy. On October 14th it was the 950th anniversary of that fateful day. 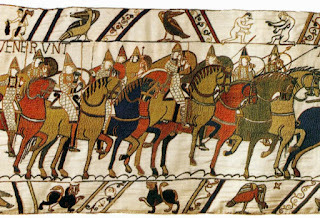 Harold had marched from Yorkshire, after winning the battle of Stamford Bridge against the Vikings, on September 25th. The battle of Hastings was fought at Senlac Hill near the town now known as Battle, and apparently William founded Battle Abbey as penance for the bloodshed. He eliminated England's old aristocracy of thegns, or lords, and sequestered their lands for himself and his barons. He built hundreds of castles and churches using forced labour, and when the English resisted his rule in the winter of 1069-70, he 'harried' them with sword, fire and famine. Parts of the North remained deserted a generation later. In order to measure England's worth for taxation purposes he instigated a survey in 1086, known as the Domesday Book, probably because its decision, like the Last Judgement, was final! 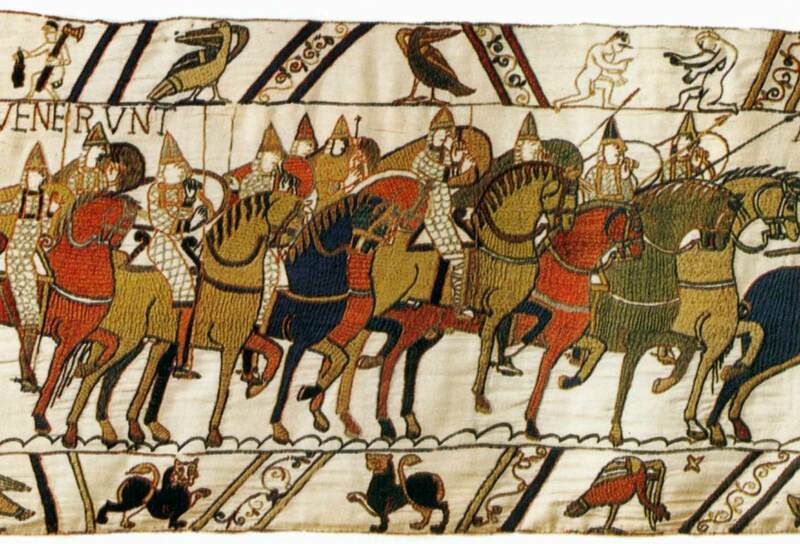 The Bayeux Tapestry telling the story of the battle is 230 feet long and was commissioned by Odo, Bishop of Bayeux and Earl of Kent who was William's half-brother. It is not actually a tapestry but an embroidered cloth; tapestries are woven not embroidered.